Now, let me get started!... First up, Tweet Talk. I stamped this sweet bird in a color of Orange Zest, Berry Sorbet and Melon Berry. The tail was inked with the Rock n Roll stamping technique using the same color combo. I created the color blocked pattern using the In The Meadow Die Collection. Next, Heart-2-Heart. I stamped a fun pattern using the patterned and tiny hearts from the set and the medium sized heart from Trendy Tree Tops. I just love this color combo... Lavender Moon, Harvest Gold, Berry Sorbet and Dried Marigold Ranger Distress Ink. Finished the card off with a sentiment and clear rhinestones. As soon as I laid eyes on this next stamp set, Baby Face, I knew I needed to recreate a fun pattern I had found previously. I've been saving it for inspiration via Pinterest here. Stamped a random pattern (onto a die cut Wine Bottle Tag) using the tiny images and then touched up with a few Copic markers. 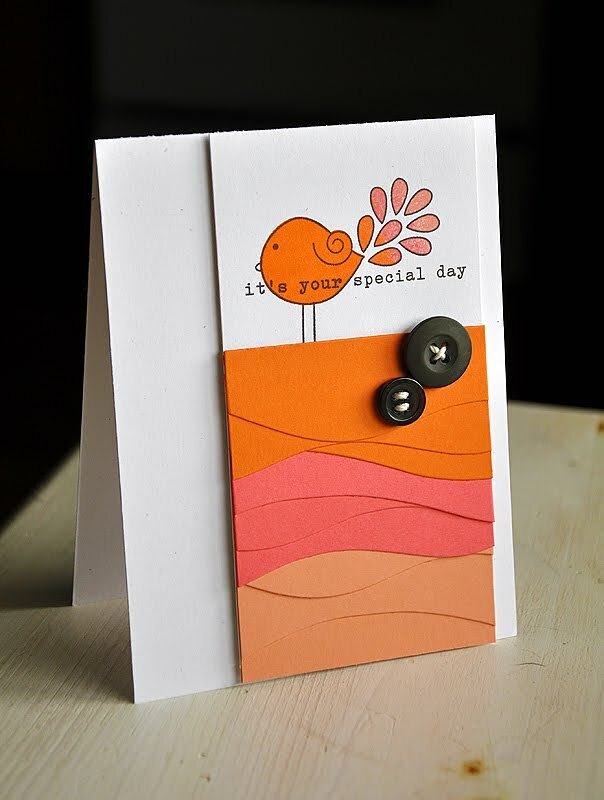 Finished the card off with a sentiment tag. Last but not least, Tag Sentiments. I began this card by stamping a border of butterflies (from the Beautiful Butterflies stamp set), along the card edge, in a color combo of Hawaiian Shores, Spring Rain and New Leaf. Then trimmed the card edge, following the stamped butterflies, to create a super cool effect. Then finished it off with the sentiment tag. 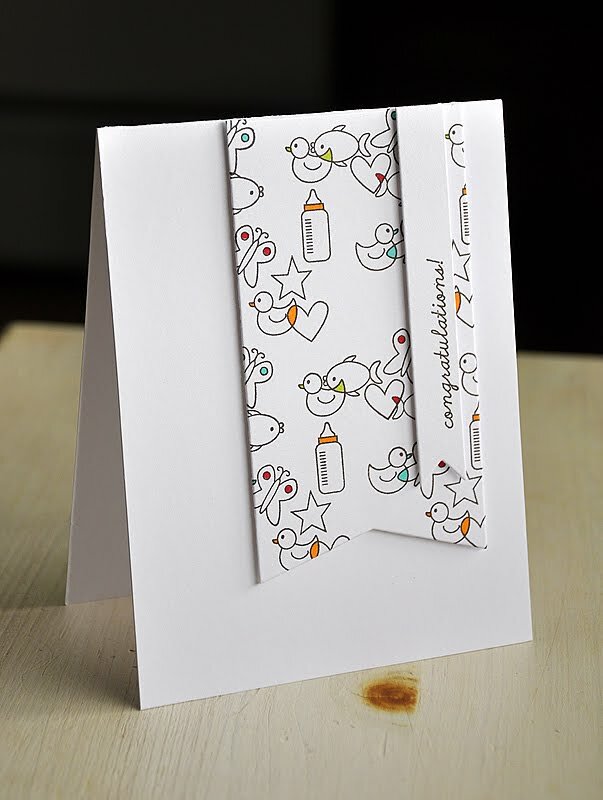 lovely cards Maile! You are so creative! Absolutely fabulous like always!!! Thank you so much for the inspiration!!!! 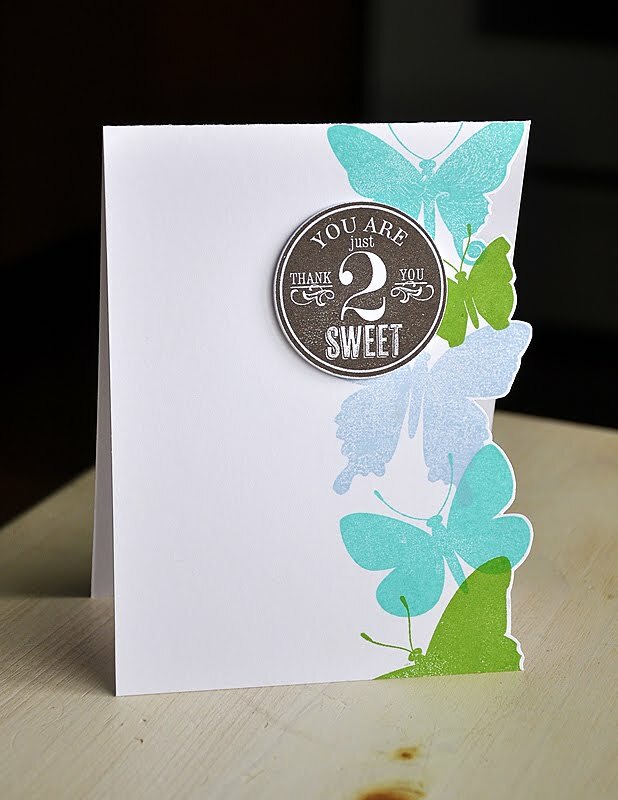 Blown away by the Butterfly card, such a great idea! I love your cards! They are great inspiration! Lovely as usual--thanks so much for sharing your talents! Always a clean and simple inspiration! You have mad cutting skills! Everything is fabulous - the small details so perfect. Thank you for the inspiration! Your Baby face card rocks it hard. Pinned! You're so inspirational. Wish I had just a nano-portion of your talent. These cards are amazing. Your color combos are always so inspiring. 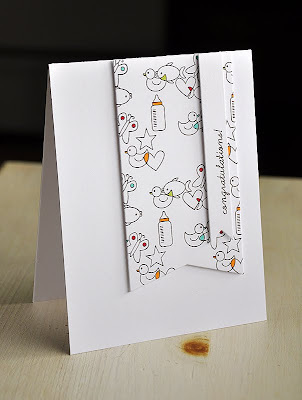 Love your baby card, so cool to do the random stamping and little splashes of colour! Gorgeous cards but the first one really caught my eye. 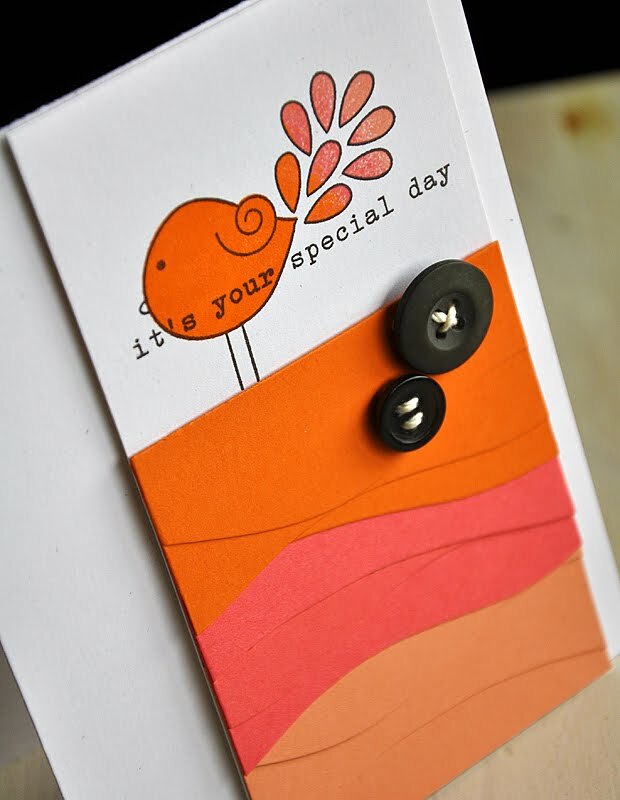 Love the layers and that bird is too cute! Beautiful... what a fun and inspirational release and week of wonderful projects! Thanks for sharing all your gorgeous work! Maile, I just love your style! Your projects are always so gorgeous! Love the way you edged your butterfly card! Makes it come to life! WOW!!! 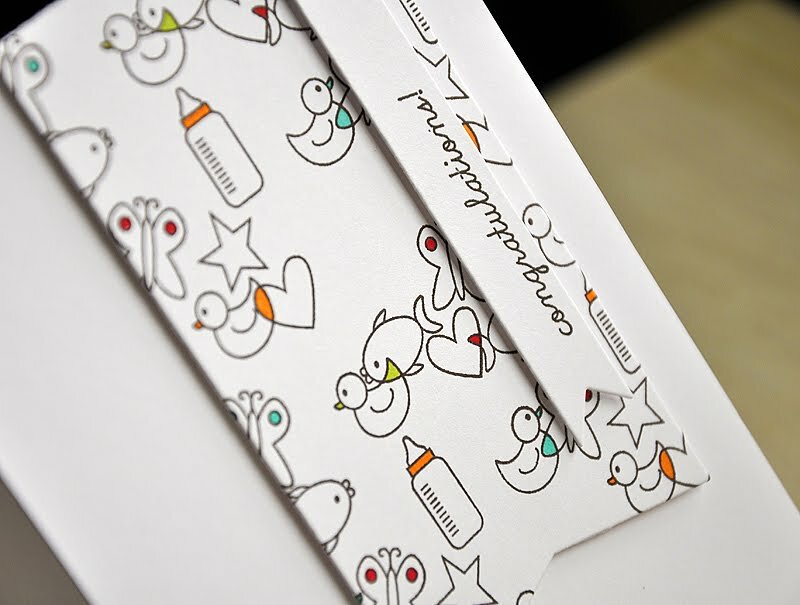 You always have the most creative ideas for stamp sets...you amaze me! I can count on you for "out of the box" ideas and inspiration. Your projects are fantastic, and I thank you for sharing them with us! I love your style!!! awesome projects! 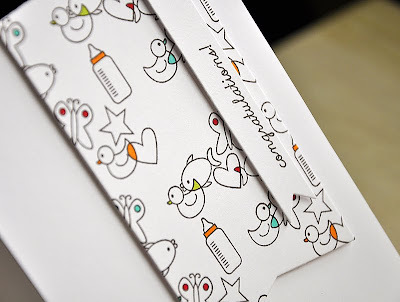 i am so in love with what you did with baby face - pinspiration at it's best!!! Love the layered texture in the Tweet Talk card -- it reminds me of the paper cut topographical maps making the rounds on Pinterest. An your interpretation of that pinned pattern in the Baby Face card is super sweet.